Floyd “Money” Mayweather Jr. will lace his gloves for the 41st time facing his toughest opponent yet, the reigning WBA welterweight champion “Sugar” Shane Mosley on May 1 (May 2, Manila time) at the MGM Grand, Las Vegas. The former pound-for-pound champion will stake his unblemished record in 40 fights and step in the ring to face one of the legendary welterweights the world has ever seen. Both guys are tested champions and their clash on weekend will inch their way on fighting the hall of famer pound-for-pound boxer, Manny Pacquiao. This fight will be very entertaining and the PPV card you wouldn’t want to miss. Both fighters can win if they capitalize their strengths and expose their opponents weaknesses. Both fighters are very good boxers but the power department is easily awarded to Sugar Shane Mosley. Mosley has fought stronger fighters in his career compared to Mayweather. Sugar Shane’s career highlight was winning both fights against Oscar De La Hoya, earning him the distinction of being the only man to beat the 6-time champ twice. Former champion Fernando Vargas also became a victim of Mosley last 2006, derailing him with two TKO stoppages. Shane will be a big threat on giving the first loss to Floyd via knockout and he knows his power is far superior. Mosley is on a roll winning knockouts on his four of his last victories including the hard hitting Ricardo Mayorga and Antonio Margarito. Shane’s card boasts of 39 knockouts in 46 wins or an 85% KO rate, capitalizing his edge in power. Floyd Mayweather Jr. is not known to be brawler and will stick in his boxing skills earning points to win a fight. Floyd avoids the thinner Cleto Reyes gloves but prefers using the brands Winning or Grant to have an additional cushion in his fragile hands. Mayweather is known to handpick his opponents throughout his career. Little known fighters like Sharmba Mitchell and obviously weaker Zab Judah, Arturo Gatti and Carlos Baldomir was his victims despite the brilliant talent he possesses. Before his short two year retirement, he defeated a washed out Oscar Dela Hoya and a smaller Ricky Hatton. He came back fighting a very undersized Juan Manuel Marquez which just resulted on a lopsided unanimous decision victory. Mayweather only had one knockout victory (vs. Hatton) in his last five victories, and a small knockout percentage of 62.5% (40 wins, 25 KO’s). Both fighters are known to be quick inside the ring. However, I see Floyd Mayweather Jr. getting the slight upper hand in the speed department. Mayweather is not just quick, he’s agile as well. He likes to maximize the area of the ring to his advantage. He sticks to his jab really well and surprises the opponent with a crushing right cross or hook. Floyd is known to capitalize this area in all his opponents, using his speed to unleash flurries and move around the ring which makes him a hard target. Sugar Shane Mosley is quick but Mayweather is the fastest boxer he’ll be ever fighting in his career. Shane displayed his speed versus De La Hoya in two classic fights, firing back crisper combination on a very good puncher. Mosley likes to fight inside and Mayweather will surely avoid it to happen. Floyd fights in a distance providing him a path to fire long bombs from afar and the inside fighting Shane will chase him all night long. Shane will never capitalize his speed in this fight and I’m sure, Floyd is too intelligent not to fight close with him. Defense will be an integral part of the fight knowing that both boxers are very good punchers. Even though Floyd Mayweather’s gloves aren’t always up all the time, I still give him an edge in the defense department. From the very start of his career, Floyd doesn’t want to get hit and successfully defending his face from damage. Floyd uses a shoulder roll defense, a style which originated from the crab stance. He uses his left shoulder as his primary tool of defense, using a short left jab to counterpunch the opponent. He’s been successful using that style for ages and still, it will be very helpful in this fight. Floyd’s defense also attributed in his distance to his opponent. He maintains a gap which is enough for him to connect his punches from a distance. Lateral movement, bob-and-weave’s and feints are also in the bag of defensive arsenals of Mayweather. Sugar Shane Mosley is a very good boxer but his defense isn’t superb. Shane loves to exploit his speed when punching regardless his opponent but he often leaves himself open. Unlike Floyd, Shane fights toe-to-toe boxing and will resort to slugfest rather than a tactical match. He’s defense is straight up and you can’t see him doing lateral movements, bob-and-weave’s and feints. Shane’s defense is pretty decent, but it will be easy for Floyd to hit him if he’ll not improve his defense in this fight. Skills can win fights but without a strong heart, you can’t be a top level division fighter. Sugar Shane Mosley picked this fight after Mayweather scrapped the fight versus Pacquiao. Shane was brave enough to call either men, but fate brought Floyd in his table. Mosley fought the best and roughest boxers in this generation and proved everyone, win or lose, that he’s heart was definitely bigger than theirs. Shane got nothing to lose and more to gain. A win with Mayweather catapults his name to the biggest draw in boxing today, which is Pacquiao. Mosley will survive 12 hard fought rounds and there’s no way Mayweather can deck him. He’ll go all out this weekend and I’m giving the heart factor to Mosley. Floyd Mayweather Jr. is fighting for pride and money. If Shane steps in the ring and successfully connects well, Mayweather is in big trouble. Floyd is known to be composed and relax when fighting but the pressure is on him right now and I believe he’ll be very nervous come fight night. Mosley is more serious now he’s been treated as an underdog in this fight. Mayweather should watch out and avoid Mosley’s fireworks especially in the late stages of the fight. Boxing is a multi-billion dollar business and fights will not happen without the interest of the boxing aficionados. Manny Pacquiao only needs one name to stamp his eternal greatness, and that name is Floyd Mayweather Jr. Floyd bad mouthed Manny about being “too small” to fight him years back, now the full blown Filipino is favored to give the former pound-for-pound champion a beating. Mayweather vs. Pacquiao is just around the corner, and obviously, Mosley is just a hurdle to stage the most expensive fight ever in boxing history. Sugar Shane Mosley fights only the best and he’s also joining the Pacquiao sweepstakes. Since everybody is more interested watching Pacquiao fight Mayweather, Mosley’s win is quite immaterial right now in the sense of sports and business. 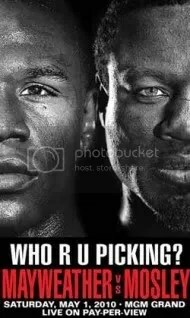 I’d like Mosley to see how he fares against Pacquiao but everyone who knows boxing will like to see Mayweather sharing the stage with the current pound-for-pound champ. Floyd Mayweather Jr. must control the fight the way he handled his past fights. He should outsmart his opponents and maintain a certain gap which he can freely operate. Fighting toe-to-toe with Mosley isn’t a good idea; He should move well and stick to his jab and hooks to confuse Mosley. Mosley isn’t a hard target and I expect Floyd backpedal as Shane goes forward all the time. Mayweather will score easy rounds on points which will be decided after 12 rounds. The only problem Floyd will be facing is Shane’s power if he connects well. Shane can knock him out and that’s the only outcome he should keep in mind throughout the fight. Sugar Shane Mosley can win this fight any round via knockout, the only problem is on how to land his punches on a very sneaky opponent. Shane must use effective jabs throughout the fight. De La Hoya’s jabs on Mayweather was doing great until the older man’s gas tank was emptied. He must work on his defense well and move better than his previous fights if he wants to score rounds against a tactician. Honestly, I want Shane to win in this fight to stop Mayweather’s arrogance but logically, it’s more harder for him be victorious this weekend. ~ by Joshua Tadena on May 1, 2010.